, an eminent French civilian, was born at Semur, the capital of Auxois, Dec. 16, 1583. After studying at Dijon, Orleans, and other places, he was received as an advocate of parliament in 1602, when only nineteen years old, and the same year he went into Germany to attend the celebrated Bongars, who was sent by Henry IV. 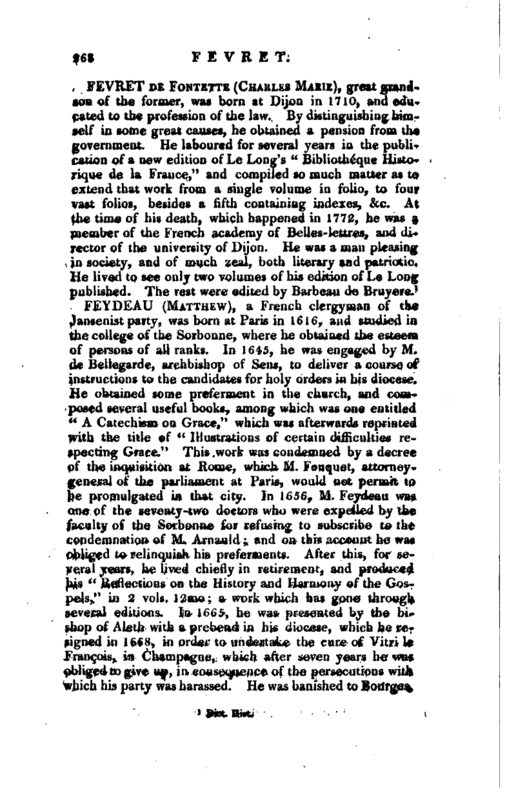 resident from France, into the empire; but soon left him, to study the law at Heidelberg, where the well-known Codefroy was at that time law-professor. 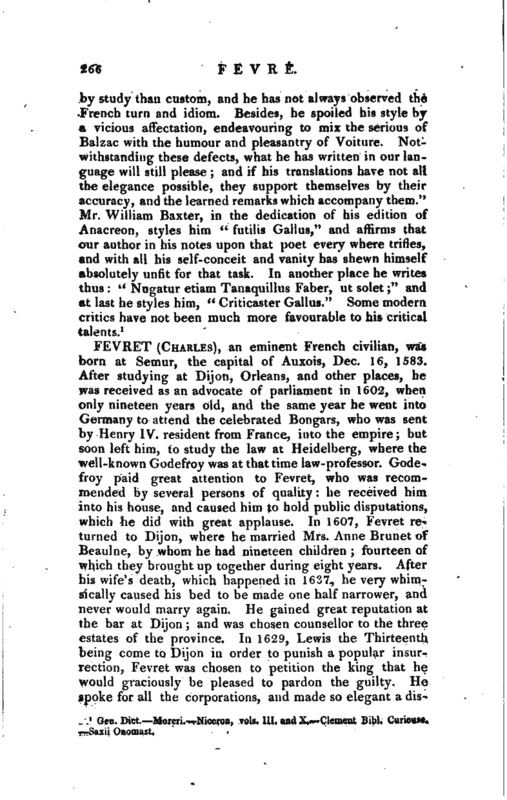 Godefroy paid great attention to Fevret, who was recommended by several persons of quality: he received him into his house, and caused him to hold public disputations, which; he did with great applause. In 1607, Fevret returned to Dijon, where he married Mrs. Anne Brunet of Beaulne, by whom he had nineteen children; fourteen of which they brought up together during eight years. After his wife’s death, which happened in 1637, he very whimsically caused his bed to be made one half narrower, and never would marry again. He gained great reputation at the bar at Dijon; and was chosen counsellor to the three estates of the province. In 1629, Lewis the Thirteenth being come to Dijon in order to punish a popular insurrection, Fevret was chosen to petition the king that he would graciously be pleased to pardon the guilty. He spoke for all the corporations, and made so elegant a | discourse, that the king commanded him to print it, and to send it to him at Lyons. 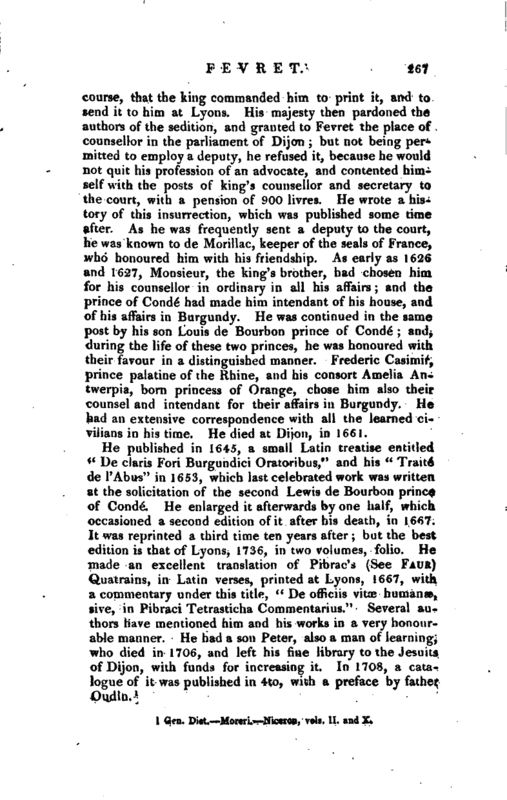 His majesty then pardoned the authors of the sedition, and granted to Fevret the place of counsellor in the parliament of Dijon; but not being permitted to employ a deputy, he refused it, because he would not quit his profession of an advocate, and contented himself with the posts of king’s counsellor and secretary to the court, with a pension of 900 livres. He wrote a history of this insurrection, which was published some time after. As he was frequently sent a deputy to the court, he was known to de Morillac, keeper of the seals of France, who honoured him with his friendship. As early as 1626 and 1627, Monsieur, the king’s brother, had chosen him for his counsellor in ordinary in all his affairs; and the prince of Conde had made him intendant of his house, and of his affairs in Burgundy. He was continued in the same post by his son Louis de Bourbon prince of Cond6; and, during the life of these two princes, he was honoured with their favour in a distinguished manner. Frederic Casimir, prince palatine of the Rhine, and his consort Amelia Antwerpia, born princess of Orange, chose him also their counsel and intendant for their affairs in Burgundy. He had an extensive correspondence with all the learned civilians in his time. He died at Dijon, in 1661.